Ashford Castle is one of those medieval castles, which today have become synonymous with luxury, style and first class service. For about 370 dollars per night, you can experience the refined atmosphere of this Irish castle turned into a hotel. The castle offers its guests splendid rooms, irresistible culinary delights and facilities for spa and beauty treatments, opportunities for fishing, tennis, golf and horse riding. Ashford Castle also boasts a beautiful park with its beautiful flower borders, a place to relax and walk. Also it is an excellent opportunity to test your hunting skills by ancient Asian method of hunting with falcons. In the park there is a beautiful lake, surrounded by picturesque chestnut, oak and beech trees. This medieval Ashford Castle is located near Cong, County Mayo, Ireland near the border with County Galway. The castle stands right on the edge of Lough Corrib. The history of the castle began in 1228 when the influential Anglo-Norman Bourg family De Burgo defeated the O'Connor clan. 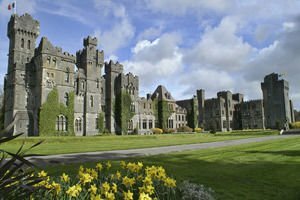 De Burgo family built several medieval castles in Ireland, but Ashford remained their main home, due to its unsurpassed beauty and grandeur. De Burgo family lived in the castle for over three centuries and a half, and then the castle had multiple owners. Over the centuries the structure of the castle had numerous restorations and reconstruction. The main building dates from the 18th century, is credited by Lord Ardilaun. The architecture of this part is outlined in the French style and it is incorporated into the old buildings. Ashford Castle is rated amongst the best hotels in Ireland, and for seven years in a row was attributed to the Guinness family. This family became the owners of the castle in the 19th century and has since done everything possible to make the most elegant and romantic castle that we see today. While offering all the comforts of a modern hotel, the castle has managed to preserve its authentic romance of a medieval fortress. The entire castle is on an area of 350 acres. The interior can not help but impress with its elegant rooms and precision to detail and unique items, furniture, etc. Vast corridors of the castle can take hours to tour. Today the castle hotel has a total of 83 rooms, each of which is furnished in an unique style. The dining room and fine restaurant is named after George V and is a favorite spot for weddings. It can fit about 150 people a view of the lake and the park is more than pleasure for the senses. The restaurant provides an excellent culinary experience including French cuisine. In addition the castle has two sophisticated bars.